It’s that time of year again… tennis time. 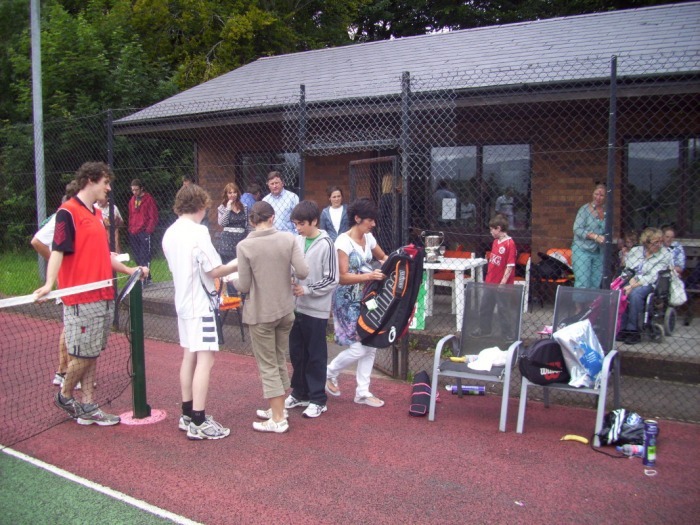 Summer was in the air when the sixth annual Primary Schools Tennis Tournament took place at the newly-refurbished, Warrenpoint Tennis Club last week. 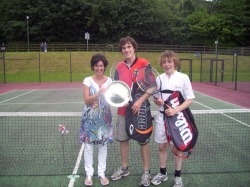 The rain kindly kept at bay and the sun shone as the children enthusiastically took to the courts. 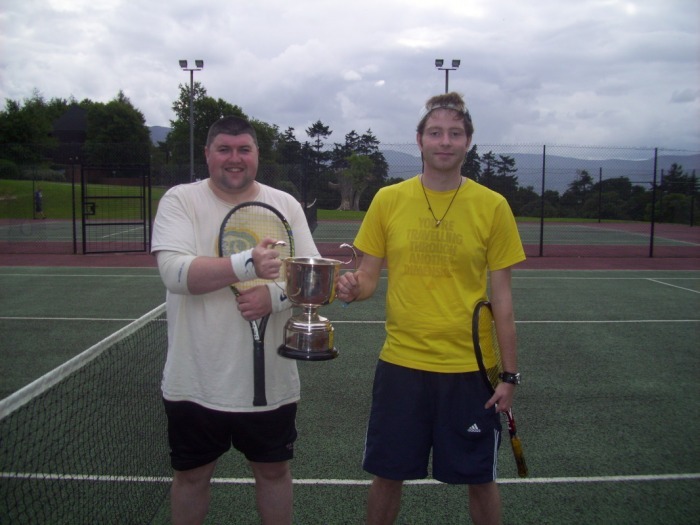 The event was run by Warrenpoint and Rostrevor tennis clubs and was sponsored by MacAdorey Optometrists of Mill street, Newry. This years competing schools were from St Dallans, Clontifleece, St Bronaghs, Killowen, Kilbroney Integrated and Carrick. Each school had an ‘A’ and a ‘B’ doubles team. 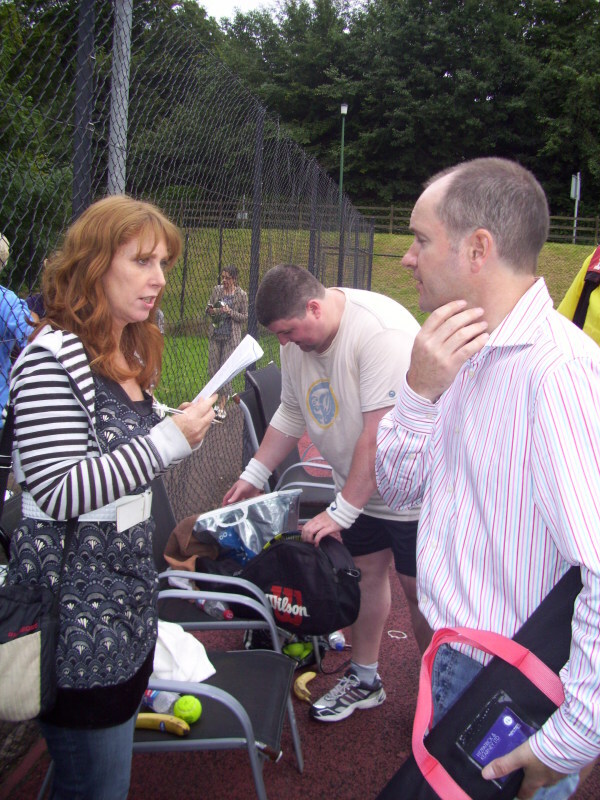 All teams played each other in eleven point matches, and the number of points won was added up at the end of the day. This format allowed for the children who were less experienced to compete with those who were more proficient. As always, the sportsmanship and behaviour of the participants was exemplary and everything ran smoothly under June McEvoy’s sterling direction. As well as the many beginners with great potential, some fantastic up-and-coming players displayed their talent in a number of very exciting matches. A lot of the credit goes to our very own Jim Pringle and Jane McIllwrath. Of the twenty-four players on the day, seventeen of them came through their coaching programmes. Players who deserve particular mention for their skills and determination are; Peter Fegan (who played with his P5 sister Creina), Stephen Finnegan, Ryan McNally and Jamie Lynch. The deserving winners at the end of a fun day were the St Dallans team, consisting of Jamie Lynch, Stephen Finnegan, Kate Daly and Amy Rice, who impressively won all of their matches. Also impressive were the runners up, Kilbroney Integrated who had never played together before. While St Dallans were presented with the cup by Joan MacAdorey, there were no real losers, as all of the other teams received gifts and certificates. Many thanks to all those involved in putting together this wonderful tournament; the organisers, sponsors, and Umpires, including Brendan Bradley. Events like this help greatly to promote tennis in our area. Thanks also to the many parents who provided food and came along to support their schools. But mostly, thanks to the children who took part. Perhaps we will see some of the P7s in the autumn representing their new schools when the post-primary tournament takes place. Until then, let’s hope we see all of the children out enjoying tennis on their local courts throughout the summer. 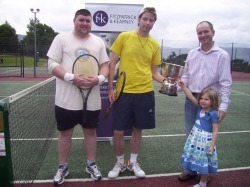 Over 100 competitors took part in the Rostrevor Tennis Tournament, sponsored by Fitzpatrick and Kearney Accountants, over the past 3 weeks. 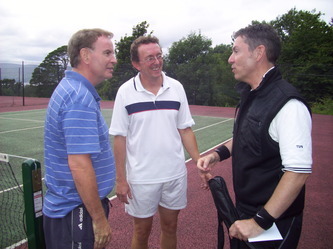 Play concluded last Sunday, with the final of the men’s doubles. A worthy finale it was too, befitting of a very successful tournament. Conor Campell and Alan McBride made it as far as the final, along with Tim Smyth and Lee Ryan after what club chairperson, Chris Gibbons said was ‘a week where the bar was set very high’. The match was very competitive from the start with Tim and Lee taking a 4-1 lead before Conor and Alan fought back to level at 5-5. The set looked like it was heading for a tie-break but Tim and Lee managed to stop the rot and win it 7-5. The second set was interrupted after the first game by a short rain delay. Players and spectators took a breather, the former grabbing a drink while the latter sampled some of the delicious food on offer in the club house. By this stage a number of passers by, out for a stroll in the park, were halted in their steps and compelled to watch the talent on display. When the second set resumed, play remained on serve until Conor and Alan were broken to make it 4-2. The next game saw Tim and Lee recover, in spectacular style, from 0-40 to take the game and go on to win the match 7-5, 6-2. 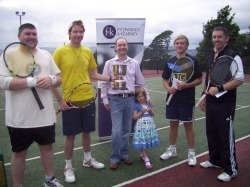 Simultaneously, on court 2, Eoghan and Patrick McMahon took on Chris Gibbons and Liam Lynch in the final of the Plate competition, sponsored by the Flood family. The McMahon brothers took the first set 6-1. The second set was a lot tighter, and when the rain started, the players decided to stay put and battle it out until the end. The McMahons emerged victorious, with a score line of 6-1, 6-4. Club chairman Chris Gibbons congratulated the winners and runners up and thanked the organisers and those involved in the running of the event; Sinead O Reilly, Eamonn Crawford, Fintan Farrell, Mary McParland, Petrina Flood and Irene McManus. He also thanked the Cup sponsors Fitzpatrick and Kearney and the Plate sponsors, the Flood family. Stephen Kearney presented the Cup to winners Tim and Lee, and Petrina Flood presented the Plate to winners Eoghan and Patrick. After their match, a delighted Tim and Lee said, ‘It’s a pleasure to play in such a well- run tournament’. It was also a pleasure for the spectators, and as Sinead O Reilly commented, ‘It’s wonderful to have such a spectacle in the park, encouraging young players and promoting tennis’. The defending champions held two critical games in the second set to clinch the match. 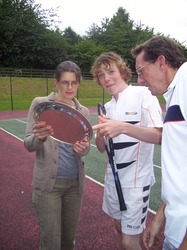 Dr Petrina Flood and family once again sponsored the Plate event, offering new tennis rackets to the winners and defending champions, Patrick and Eoghan McMahon. Running clockwise, Elaine Leddy, journalist, takes comments from Event sponsors, Stephen Kierney; family and friends after the tournament; Lee Ryan and Tim Smyth, 2010 champions; Club secretary and Chair, Sinead O'Reilly and Chris Gibbons, checking the names on the plate with winner Eoghan MacMahon; Final Umpire, Eamonn Crawford, and Chris chat with finalist Alan McBride. Aaah Wimbledon! Over for another year. All that remains is the sunburn and the grass stains on the backside of many a strappy sundress, courtesy of 'Henman Hill' (or 'Murray Mound' to the optimistic, indiscriminate Brit). Into the recycling bin go another set of designer tennis whites. Players board their planes at Heathrow trying to contemplate the more colourful wardrobe necessary for the next major battleground, the U.S Open, rather than dwell on the missed backhands and unforced errors that helped Serena and Raffa on their way to victory. Packed away into the cedar chests are the Ralph Lauren designed uniforms of the stewards and officials. Into the hatboxes go the boater hats. Back to the leafy suburbs their owners retreat, to contemplate another vintage year. Wimbledon, civilised as always, so civilised in fact that the only police presence we encountered was when we were making our way back to the tube station at the end of the day. They came in the form of a vanload of bobbies driving down the sunny street singing jovially along to the Python crew's 'Always look at the bright side of life' being megaphoned from their vehicle. This drew a chuckle from the tired tennis fans facing their journey away from the village that is suspended in time each summer by the unique tradition that this tournament represents. It was indeed a vintage year. The Queen made an appearance for the first time since 1977. John Isner and Nicolas Mahut were reluctant to leave at all. They created history in their epic 11 hour 5 minute match, which Isner won by a hair. 70 games to 68 in the fifth set. Bravery was also personified by 53 year old veteran Martina Navratilova who came to present for the BBC, and compete, just 4 days after finishing cancer treatment. She won the invitational doubles event with her partner Jana Novotna, receiving a standing ovation from the appreciative court No.1 crowd, many of whom came to watch, having abdicated from the bum-numbing 'Henman Hill', and Nadals inevitable-seeming victory. The contenders and pretenders to the throne battled hard throughout the fortnight. some went out with a roar, others with a whimper. Venus and Roger disappointed, but they'll be back to do it all again next year, as will I. I'll apply for the ballot again and maybe this time I'll be lucky and get those coveted tickets for centre court. Tickets for Wimbledon can be hard to secure for the general public. 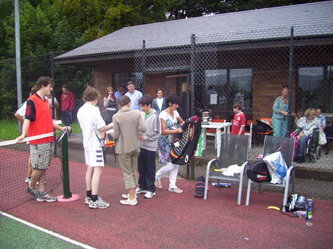 Each year however the club sell a number of tickets for the 4 main courts via public ballot. Information on obtaining an application form for the ballot is available on the official wimbledon website www.wimbledon.org . Applications for 2011 start in August this year and must be received by December 2010. Successful applicants are randomly chosen by computer and tickets can only be used on the day and court specified. These tickets cost between £25 and £60 for the day. Ticket holders can also go to any of the grounds courts. For die-hard fans who can't get tickets, the 'queue' is another alternative. About 6,000 grounds tickets are retained each day for those who queue. Arriving early in the morning is a must (about 7am). If the weather is good it's not a bad experience. On arrival you are given a ticket number. This means that your place is secure and you can leave your spot, to check out the vendors and entertainment. While the queue looks daunting, snaking through fields for what seems like miles, once it starts to move around 10am, it moves steadily at walking pace. More information can also be found at the Wimbledon website. Just can't wait until next year to see some scintillating tennis? If the sun, Pimms, strawberries and cream and centre court are not high on your agenda, the ATP world tour finals, featuring only the top 8 players in the world, is on at the O2 London in December. Tickets are available now. As for me? I think I'll try to get those grass stains out and put my boater away until next year.